Raghavendra Swamy was teaching his disciples when he suddenly looked up and made a sign with his fingers. His disciples could not make anything of the gesture and they asked Rayaru the reason. Rayaru smiled and told them that he had seen his friend Krishna Dwaipayana, a Madhwa saint, go to heaven. Rayaru said the departed soul asked him how long he (Raghavendra) would stay on as a mortal. He said he had shown two fingers thrice, indicating that he would live on the earth physically for two years, two months and two days. The disciples were taken aback and looked dismayed. Rayaru consoled them and he decided to prepare for his Brindavana Pravesha. He chose Manchale now in Andhra Pradesh as his final resting place. Manchale then came under the jagir of Nawab Siddi Masoud, a Governor of the Bijapur Kingdom. Siddi Masood was headquartered at Adoni or Advani. Raghavendra Swamy sent word to Diwan Venkanna (He was the same person who suddenly started reading due to the grace of Rayaru. Pleased by this, Masood had made Venkanna his Diwan) that he would becoming to his province along with all paraphernalia of the Sri Matha from Kumbokanam. Raghavendra Swamy knew too well about the mischief of the Nawab. He meditated for a moment and took the holy Theertha from his Kamandala and sprinkled them on the plate which was covered with a clothe. When the plate was uncovered, the Nawab was shocked to see that the mutton pieces had transformed into flowers. He immediately fell at the feet of Raghavendra and sought his forgiveness. “Please let me know what I can do to atone for my sin”, he begged Raghavendra. The Guru only smiled. When Masood insisted, Raghavendra sought for land at Manchale, a small village across the Tungabhadra. He gave the fakir another piece of land and gifted Manchale to Raghavendra Swamy. Raghavendra Swamy then stayed at the house of Appanacharya, a rich Zamindar, at Bichale near Raichur. Both Rayaru and Appanacharya became close friends and spent hours discussing Vedanta and other related subjects. Appanacharya lovingly cooked food for Rayaru and also for Naivaidya of Moola Rama and other deities of the Sri Matha which had been bought in the Devara Pettige (box which held the Samsthana idols of the Matha) from Kumbakonam. Rayaru knew that Appanacharya would not let him enter Brindavana. He, therefore, entrusted the task to Diwan Venkanna. Rayaru also pointed to a stone slab near Madavara village and said he wanted the Brindavana to be constructed from it. Rayaru said Rama during his wanderings, had sat on this stone and that he wanted the Brindavana to be covered with it. Venkanna immediately set about preparing the Brindavana. Meanwhile, Rayaru also showed Venkanna and Masood the spot where he wanted the Brindavana to be built. He also specified the size of the Brindavana and how the pit should be dug. Some time later, Venkanna showed the Brindavana to Rayaru. Looking at the exquisite Brindavana, Rayaru said this would be occupied decades later by one of his successors. “He is more suited than me to occupy this place,” Rayaru said and asked Venkanna to construct a much simpler Brindavan. This suitable man was none other than Vadeendra Theertha, the great grandson of Rayaru. All this while Rayaru was still staying at the house of Appanacharya. He decided to dismantle the ant hill in the house of Appanacharya where a cobra (sarpa) had made its home. Rayaru would give it milk every day and the cobra would come and drink it. Rayaru ensured that the cobra moved away from the ant hill. This was because he realised that people would be scared of the snake after he entered Brindavana. He also wanted to protect the Sarpa from harm. Appanacharya on Sanchara and decided to enter Brindavana. Rayaru decided to enter Brindavana on August 11, 1671. This day was Friday. He made all the arrangements himself. By then the Brindavana was ready. His friends and relatives, devotes and other people began pouring into Manchale. By this time, Rayaru had already made Yogendra Theertha, his successor. Yogendra Theertha was the grandson of his brother Gururaja. Both Raghavendra Swamy and Yogendra Theertha stayed for some time and prayed at the Venkatarama Temple in Manchale to observe Chaturmasa. Rayaru then prayed to Manchalamma and told her of his plan to enter Brindavana. Rayaru sang “ Namosthu Varade Krishne Kumari Bramacharini Baalrka Sadrushaakaaye Purnachandra Nibhaanane Yam Kaamaye Tam Tamugram Krunomi Tam Bramanaama Tamrushini Tam Sumedhaam” and Manchalamma was pleased. A day before Rayaru entered Brindavana, that is on Thursday, (Shraavana Bahula Pratipada) Rayaru performed the Pooja of Sri Moola Ramadevarau and other deities. It was a normal day for him, while all others had a heavy heart. Raghavendra Swamy held discussions on Acharya Tatva. After having his daily frugal meal, Rayaru gave a thought to the next day’s programme. He called the Matha officials and also his successor and gave them instructions. The next day dawned and Rayaru spent his time in ritualistic bathing in the Tungabhadra as was his normal routine. He then prayed to his beloved Moola Rama one last time and performed other pooje. Then began his final discourse on the Brahma Sutra of Madwacharya and its interpretation by Jayatheertha. However, none of the devotees and disciples had the heart to understand the lecture. They were heartbroken as it was the last lecture of Raghavendra. Soon after his Patha, Raghavendra then took the hand of Yogendra Theertha and walked towards the Brindavana. 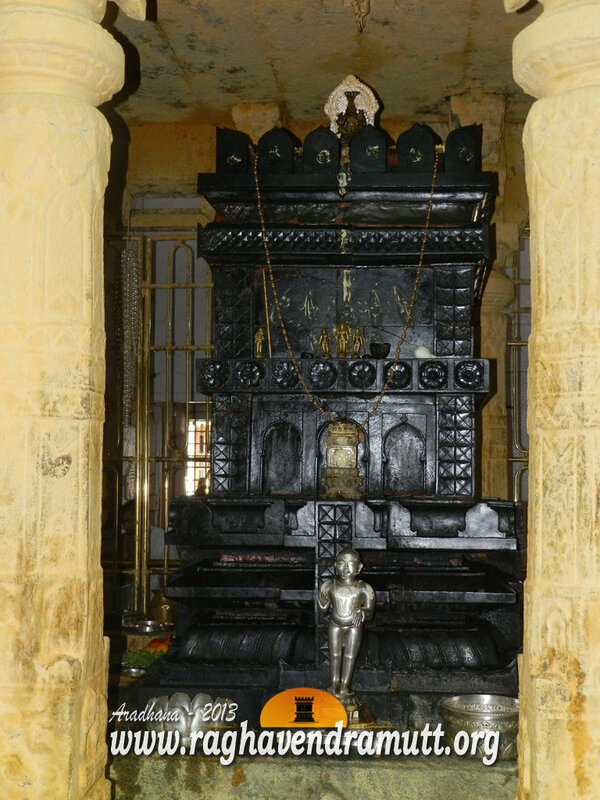 The Brindavana was constructed on a platform with steps. Rayaru was taken in a proceesion on the temple elephant Mahendra. Rayaru had his Danda and Kamandala with him. He appeared calm and blessed the devotees along the way. When the procession came near Garbalaya where the Brindavana was constructed, Rayaru alighted from the elephant and took out his Paduke and handed them over to Yogendra Theertha. Meanwhile, Yogendra Theertha had constructed a Pranadevaru temple opposite the Brindavana as per Rayaru’s wishes. Even on the last day, Rayaru performed three miracles. A dumb youth got back his power of speech and a lame person got back his limbs. His last miracle was to cure a youth of leprosy. Rayaru’s son, Lakshnimarayana, Rayaru’s nephew Narayanachar, Diwan Venkanna and others watched with a heavy heart as Rayaru was moments away from entering the Brindavana. Vadeendra Theertha then was just two years old when Rayaru entered the Brindavana. (He became the head of the Mantralaya matha five swamijis after Raghavendra. He wrote Gurugunasthavana, a composition of of 36 verses). Rayaru then raised his hands in blessing to the assembled crowd and made his last speech. He asked people to be righteous and follow the path of Dharma. He entered the Brindavana with his Kamandala and Japa mala. He held the hand of Yogendra Theertha and walked into the Brindavan enclosure. He entrusted the Matha to Yogendra Theertha and once again commended the people to follow the path of righteousness. Rayaru then began meditating and he had asked Venkanna and others to close the Brindavana once the Japa Mala fell from his hand. The moment came and the Brindavana was closed forever. When Appancharya swam across the swirling waters of the Tungabhadra when he heard the news of Rayaru entering Brindavana, it was too late. Rayaru had already entered the Brindavana and Appanacharya sorrowfully sang Purnaboda. Raghavendra was the final avatar of Prahalada, Balika Raja and Vyasa Raja. Vyasa Raja was the Raja Guru of six emperors of the Vijayanagar dynasty. As Vyasa Raja, he was instrumental in developing the Haridasa Sahitya –the Dasa Koota and the Vyasa Koota in Karnataka. Vyasa Raja was also responsible for encouraging Purandara Dasa and Kanaka Dasa in their endeavours. Vyasa Raja left the mortal world in 1526 and Purandara lived on till 1564. Kanaka too lived longer-till 1609. Vyasa Raja was reborn as Raghavendra Theerta in 1595. By the time of his birth, Hampi or Vijayanagar had been totally destroyed and the glory of the Vijayanagar Empire had faded. When Vyasa Raja was alive, Hampi was one of the greats cities of its time and its fame had spread far and wide. Foreign travelers and historians made a beeline to Hampi and went into raptures describing the beauty of the city. The glory of Hampi was not only due to the deeds of the Vijayanagar Emperors but also due to the unmatched growth in art, literature, religion and philosophy. One of the shining lights of the Vijayanagar period Was Vyasa Raja or Vyasa Theertha. Almost all the foreign travelers such as Nuniz, Domingo Peas and even Razak have spoken glowingly of this seer and his achievements. Vyasa Raja had gathered a galaxy of shishyas each outdoing the other. Some of the Shiashyas were Vijendra Theertha, Sudhindra Theertha, Vadiraja Theertha, Purandara Dasa, Kanaka Dasa, Vaikunta Dasa and many others. If Purandara was the master of Carnatic music, Vadiraja Theertha was God personified. Vijendra Theertha was an embodiment of the 64 arts. Many of the disciples, including the above mentioned greats met Vyasa Theertha, also called Vyasa Raja or Vyasa Raya at Hampi. On one particular occasion, Vysaa Raja asked all his disciples to get together. The meeting took place at the Vijayanagar Vishwa Vidyalaya, of which Vyasa Raja was the Chancellor. Even as the gathering watched, Vyasa Raja called all the three-Vadiraja Theertha, Purandara Dasa, Kanaka Dasa- and discussed some aspects of the shastras and Vedas with them. The gathering was spell bound as they realized that they had in their midst four persons who had seen Sri Hari with their own eyes. It was then Vyasa Raja revealed a side he had never before shown anybody. Turning to Vadiraja Theertha, he said you will continue to live for many more years. (Vadiraja Theetha outlived Vyasa Raja and entered Brindavana only in 1600. By the way, Vyasa Raja entered Brindavana in 1536). He then spoke lovingly to Purandara his favourite disciple. He said, Purandara you shall live longer than me but you have sic more births to go before attaining Moksha. Vyasa Raja then astonished the gathering by telling Kanaka Dasa that he would meet him in the next birth. Vyasa Raja had given the Ankita Nama Kanaka to Thimappa Nayaka. This was the first indication that Vyasa Raja gave to his devotees about his coming avatar as Raghavendra Swamy. Vyasa Raja passed away in 1536 and took rebirth as Raghavendra Swamy in 1571. By then, Purandara had died (in 1564 in Hampi) and Vadiraja Theertha was staying at Sode near Sirsi. Kanaka Dasa was wandering around Karnataka and other places singing the glory of Hari. It was sometime in the 1650s that Raghavendra Swamy once came to Bellary and stayed at a Hanuman Temple on the banks of the Tungabhadra. Rayaru went to the river and had a bath. He then was about to enter the temple for performing the Moola Rama pooje when he noticed a person belonging to a lower caste standing nearby. Rayaru looked at the person and spoke as if he had known him all his life. “What, Kanaka. How are you. What are you doing here”, asked Rayaru. Rayaru smiled at the answer and retorted, “If so what will you offer to my lord”. The person said he would bring something and vanished from the place. He came back and gave a packet to Rayaru. The packet had mustard seeds. Rayaru did not say anything but handed over the packet to the cook and asked him to use it for the day’s cooking. This astonished everybody present there as it was Chaturmasa (October to January) and mustard seeds were Nishida or banned. All the while, the person sat outside the temple watching the proceedings. When Rayaru finished the Moola Rama Pooje, he turned towards the person who then burst into a melodious song praising Moola Rama. The perplexed devotees did not understand anything. It was then some persons in the matha where Rayaru was staying confirmed that Rayaru was Vyasa Theertha in his previous birth and he had just met Kanaka Dasa who had been born as a low caste person and helped him attain Moksha. One of the eye witnesses to this entire episode was Krishna Swamy, a businessman. It was he who has recorded the incident and passed in onto others. Vyasa Raja had ruled over the Dharmic kingdom of Vijayanagar. However, Vijayanagar was shattered after the battle of Talikota in 1565. When Raghavendra Swamy visited Hampi, Nava Brindavana and Hospet, the Vijayanagar empire had practically vanished from the scene and all he saw was utter ruin and desolation. Yet, not for a moment or even a day did Raghavendra Swamy allude to his glories during his past incarnation as Vyasa Raja. The only physical evidence he gave to his disciples was when he sat and meditated in front of the Brindavana of Vyasa Raja in Nava Brindavana. The devotees could not contain their curiosity and some among them wanted to know why the venerable Vyasa was visible only to their Guru. It was then Raghavendra revealed that he was born as Vyasa Raja in his previous incarnation and he was only speaking to him.